Cecil F. Brownie earned DVM and PhD degrees at Cornell University. He served on the faculty at the College of Veterinary Medicine, North Carolina State University for 24 years, teaching Toxicology to the students in the Veterinary program. He retired in 2006. In addition to providing routine medical care, Dr. Brownie's area of specialty is diagnosis and treatment of poisoning cases. He is Board Certified in both Veterinary and General Toxicology, and is an expert on plants that are poisonous to animals, as well as the treatment of toxicity due to chemicals such as pesticides and household cleaners. 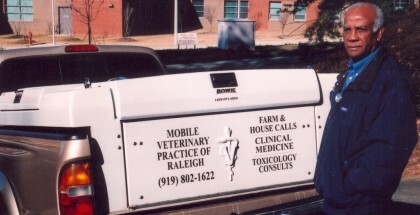 Dr. Brownie has consulted on numerous cases involving poisoning of horses and livestock on farms in North Carolina, Virginia and overseas, as well as cases involving dogs and cats in the Small Animal Hospital at North Carolina State University. Medical care for cats, dogs and other pets is provided in your home. Hospitalization, Surgical procedures and X-ray procedures are not provided. As a Board certified Toxicologist and Fellow of the American College of Forensic Examiners, Dr. Brownie provides consultant services and expert witness testimony in forensic investigations of poisonings involving livestock, horses and pets. Evening and weekend appointments can be scheduled. Fee for service includes a charge of $2.00 per mile (one-way) to your home from the Wade Ave/Ridge Rd intersection, Raleigh, NC 27607. Payment (cash or check) is due at time of service. If you do not get an immediate response in an emergency, we recommend that you contact Boulevard Animal Hospital (919.828.7468) or Crossroads Veterinary Hospital (919.851.8979).